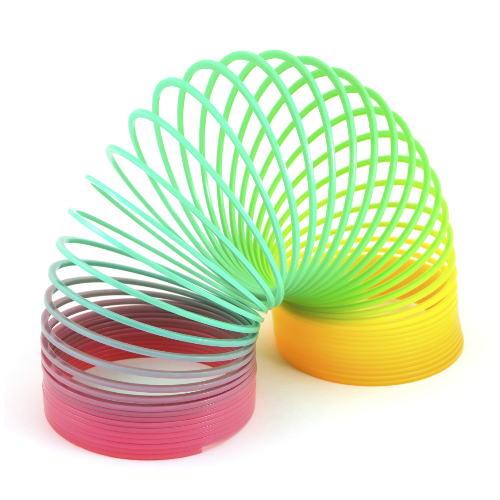 At European Springs we are purveyors in all things spring manufacturing, and whilst everything from our gas springs to our wire forms appear in an almost incomprehensively large range of products, there are few springs which have made a bigger cultural impact than the Slinky. On Sunday 30th August, the world gathers together to celebrate the humble Slinky. To celebrate we felt it apt to dedicate a blog to the spring-based toy which has sold over 300 million units in its 70 years on the market, and brought smiles to the face of countless children through its synonymously rainbow hues. Its inventor, Richard Thompson James, left Pennsylvania State University with a degree in mechanical engineering and began work as a naval engineer. Due to America&apos;s involvement in World War II, he sought a desk job in a shipyard – where the Slinky was born… accidentally. After knocking over a tin of spare parts he watched a spring step its way down some coincidentally lain books and onto the floor. The Slinky was merely the correct type of steel and appropriate tension away from becoming the toy we know and love today. Through incorporating a high carbon steel wire of 0.0575 inches in diameter, James was able to get the Slinky to comfortably &apos;stroll&apos; down his staircase. The law of physics which makes this possible is Hooke&apos;s Law which specifies that the restoring force is proportional to that of the displacement – meaning that the potential energy from the spring&apos;s downward movement is converted into kinetic energy, thus &apos;stepping&apos; over itself until it reaches a flat surface. Another fascinating observation which has since been made regarding the Slinky occurs when you hold it from a height and allow the bottom to hang down at full stretch. When you let go of the top, the bottom stays in the same place as opposed to also dropping with the top. Whilst this seems like an unusual phenomenon, it is related to the passing of information. As the Slinky collapses together at the top, it is the passing of &apos;information&apos; that is needed to instigate the collapse further down the Slinky. As is explained in the video, Information has to propagate if they&apos;re not at the same location, so in essence, the base of the Slinky is unaware that any effect is underway. To think people just enjoy watching the bright rainbow colours descend their way down the stairs… who can blame them? There is a lot to be said for the popularisation of the Slinky – even appearing in huge cinematic blockbusters like Toy Story – but it is the unsung heroes of the spring world that make the technological-world go round; they&apos;re the ones on the front line making the life-changing advances, bringing you phones, computers, machinery, transport… You get the point. So if you would like to discuss the miraculous work that the spring can undertake, or to hear of the services we provide at European Springs, don&apos;t hesitate to give us a call. You can contact us on 0208 663 1800 where one of our friendly team members will be eagerly awaiting your call.